We’re “boomers” born after 1947, that’s all that can be said without up setting one of us. We live in Charlottesville, VA at the foot of the Blue Ridge Mountains and The Skyline Drive. We enjoy the out doors and have camped our entire adult lives. When we were young we camped in a tent and to be honest we thought that anyone who stayed in an RV was missing the camping experience. We thought you might as well stay in a hotel if you were going to be inside an RV. Oh, how times and people change! We love wandering around the back roads (blue highways) of our beautiful country meeting and talking with interesting people. As we began to see friends and family pass away we decided to travel and see America while we have our health and are still able to do it. Along the way we made an interesting discovery; RV’ers are the nicest group of people! It is a truly egalitarian group, you could be talking to a Chief Justice of the U. S. Supreme Court or to someone getting by on very little. It doesn’t really make any difference everyone is nice and helpful. If you need to know what to see or do in any town where you are staying or if your “rig” is broken and you need help the RV community is there to help. You can follow us as we travel America, laugh at our mistakes, and enjoy America and the wonderful people that whom we meet along the way. 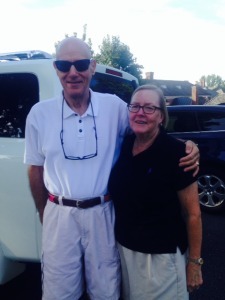 You can live vicariously through us and our blog – “Ed and Roberta Living the Dream”! Love following this adventure with you! If you make it to the Bay Area, come stay Chez Fishburne! We have a driveway the turtle can live in, but you’ll have to back in. (by then you’ll have so much experience, it’ll be a piece of cake!). PS: Johnny M. is home! Randy: Just keep the original email we sent you with the log in information and you can check in any time you want. We are behind so give us a few days to update. We are in New Orleans and there has been so much to see and do.